Recently I arrived in Shabla in Bulgaria which is a small town on the Black Sea coast. Two years ago we held a tent mission there and saw around eighty people become Christians. These were followed up by a couple, Chavda and Julia, who are graduates from our first mission school held in Sofia. They moved home from Blagoevgrad to Shabla, some eight hours drive away, to enable them to do this. They now pastor a new church established from the fruit of the mission which meets in four homes around the town. They invited us to return this year to host a follow up mission. 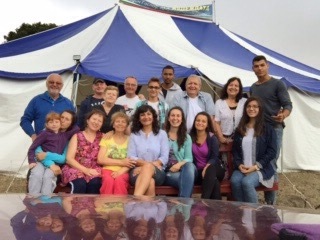 People joined us from around Bulgaria and England to make up the team and we saw sixty plus people come to know Christ as their Lord and Saviour during the five day mission. Many people were touched by God’s power and experienced healing. One policeman who became a Christian during the previous mission experienced healing in his finger which doctors had told him would never work again. This resulted in both his daughters also giving their lives to the Lord. One day we were out in the town inviting people to come to the mission when I looked over a garden fence to see twenty two members of a family sitting at a table in the garden eating lunch. The man at the top of the table immediately recognised me and told me that he had seen me on television two years previously and felt a voice inside him say, “one day that man will come to your house”. We were invited in and spent two hours talking with the family about the Lord. As we did this one girl filmed our conversation on her phone to show it to other family members. It transpired that they were only there for the day as they all worked in different nations around Europe. God had prepared the way for our meeting two years before that they might hear the gospel that day! Praise God!